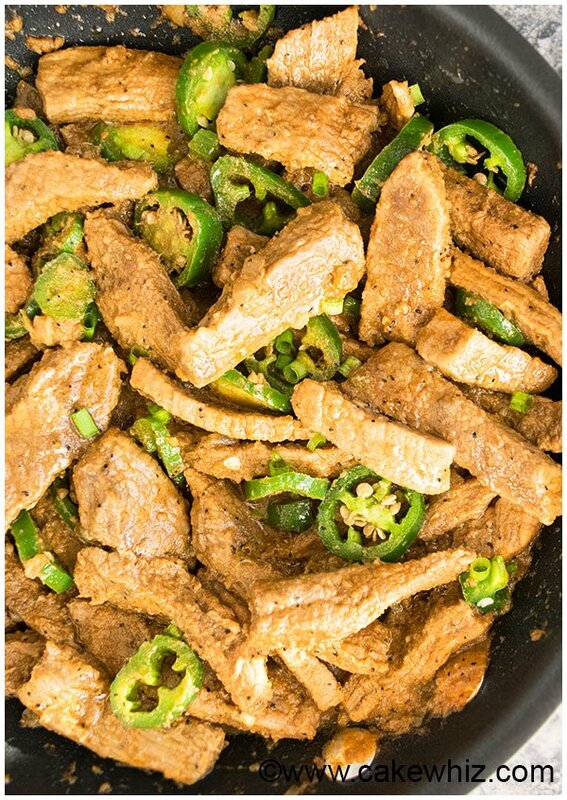 Quick and easy Chinese jalapeno beef recipe is a 30 minute meal. 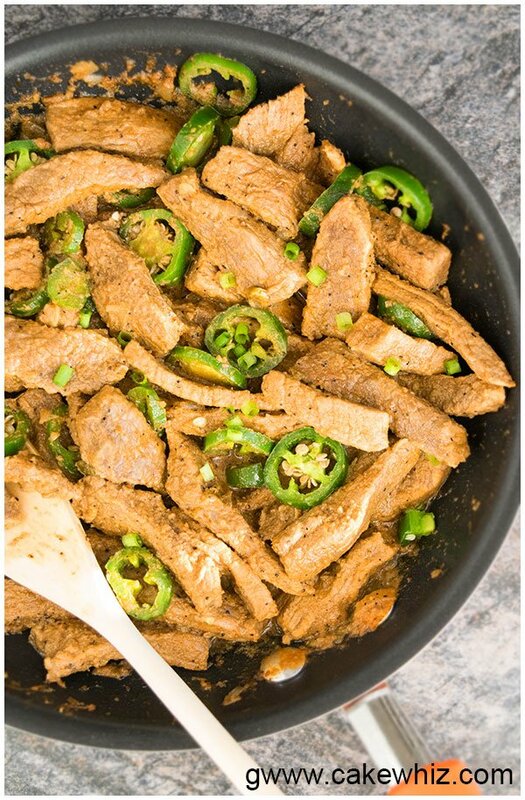 This spicy beef recipe has a sweet and spicy flavor and requires just one pan! 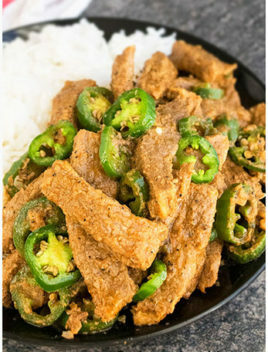 After the SUCCESS of my jalapeno chicken recipe, I knew I had to share this SPICY jalapeno beef recipe with you guys too. This recipe is different than the chicken version but still has a lot of ASIAN flavor. You need SIMPLE ingredients that are already in your pantry. The beef is so TENDER and flavorful and packed with sweet and spicy flavors. I also want to point out that this is not a traditional jalapeno beef stir fry because my cooking method is different but it still tastes INCREDIBLE! 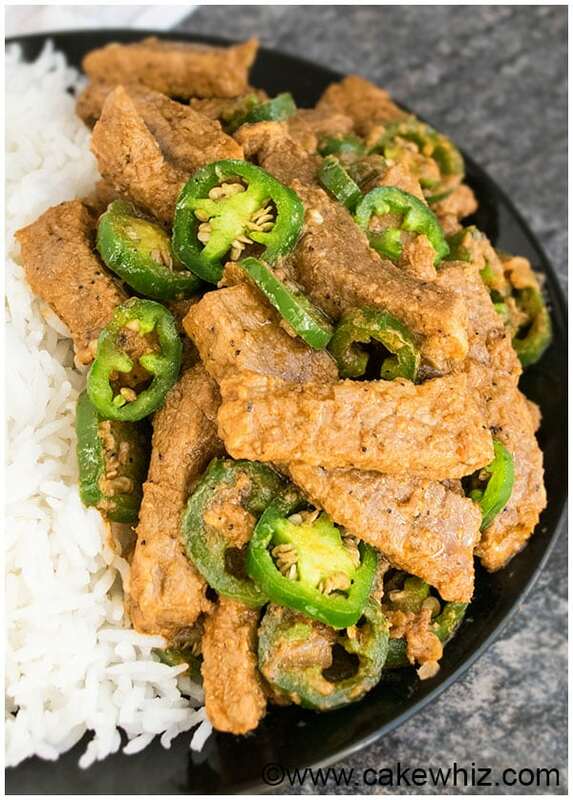 How to make jalapeno beef? Heat oil in a pan and add ginger, garlic and jalapenos. When everything is golden brown and fragrant, add all the sauces, spices and beef. Cook for a few minutes. Then, add broth and additional jalapenos and cook until beef is tender and liquid is reduced. Garnish with green onions. Serve with jasmine rice and enjoy! DON’T use canned jalapenos! You must use fresh jalapenos. Some people like this recipe sweeter to counter to spiciness. ADJUST the amount of brown sugar, based on your preference. Use sesame oil! It ENHANCES the flavor of this meal so much. Tastes best when served with rice but can also be served with noodles. You can adjust the amount of jalapenos to suit your “spice” preference. I definitely RECOMMEND adding some black pepper. It really takes the flavor up a notch! Fresh ginger and garlic can be replaced with ginger and garlic paste as well. If you prefer your beef very well done, cover the pan with a tight lid and cook for an additional 15 minutes. Make sure to add some water (about 1/4 cup) to prevent the beef from burning or sticking to the pan. DON’T replace broth with water! Broth adds flavor and water brings NO flavor to this recipe. You can use whatever broth you like: chicken, beef or even vegetable! I suggest using LOW SODIUM broth and slow sodium soy sauce to prevent this meal from getting too salty. If you don’t have hoisin sauce, you can OMIT that. For a slow cooker spicy beef recipe, add all the ingredients in a slow cooker and cook on high for 3 hours. Timing may vary depending on the brand of slow cooker you use. The flavor and texture of the beef is definitely not the same as this one pan version but it’s a nice change. 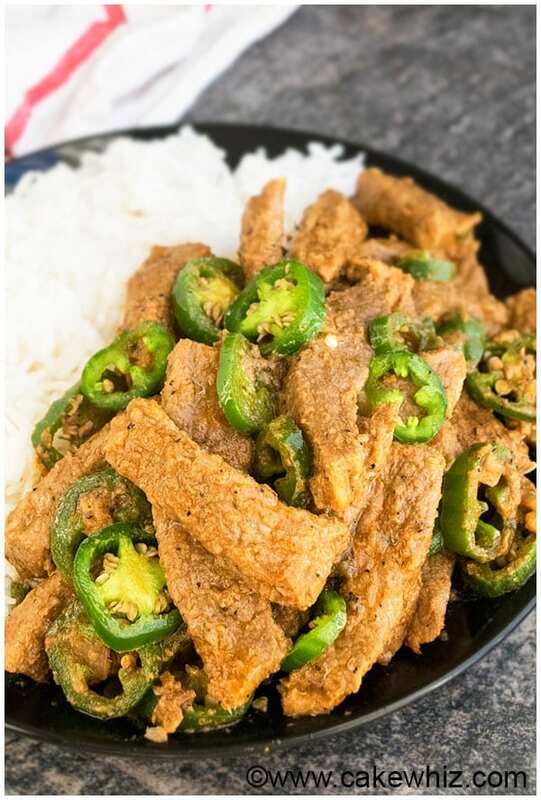 To make slow cooker spicy shredded beef, use a big chunk of boneless beef (2-3 pounds) instead of beef strips and use this same ingredient list but double the quantities. Shred the beef with 2 forks at the end. Add ginger, garlic and finely chopped jalapenos and saute until golden brown. Add Sriracha sauce, hoisin sauce, soy sauce, vinegar, salt, pepper, brown sugar. Mix everything together. Add beef strips and mix everything together. Cook for about 2 minutes. Add broth and sliced jalapenos and cook until beef is tender and cooked through and liquid is reduced. Read all my tips and notes above. Tastes best when served fresh with rice. However, leftovers can be stored in a sealed container in the fridge for up to 2 days and reheated in the microwave or stovetop. I totally agree with you! Simple is always best!